I know, it seems like a totally random combination - but we have been in a snacking kind of mood lately and this is what we've been eating. And they are both really really good! These are seriously so easy to make, they take less than 10 minutes to make and then about another 10 to bake and then you get a good-for-you snack that tastes like it should be bad for you but it isn't. 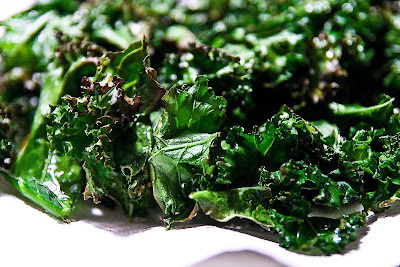 If you have never had kale, or don't know what to do with kale then you HAVE to try these chips! 2. Rip the kale leaves from the tough stalk and tear them into biggish pieces. 3. Drizzle a very light amount of olive oil onto a cookie sheet. Put the kale pieces on the sheet and swirl them around in the oil so that they are lightly coated (at this point my hands are fairly oily so I pick up each piece and just rub the oil gently into each leaf, making sure the piece is evenly coated...you really don't need to be heavy-handed with the oil, a little goes a long way). 4. Spread out the leaves and sprinkle with just a small amount of sea salt (I think I use more than 1/4 but less than 1/2 a teaspoon for the whole bunch). 5. Pop the cookie sheet into the oven for about 5 minutes - my kale always starts to brown at the edges at this point. 6. Take the kale out and turn the pieces over, then bake for just a couple minutes more (you have to watch them because they burn really quickly. I usually do 2 or 3 minutes on the second side). And that's it! They come out paper thin and light as air - and soooooo good. Perfect for couch-potato snacking after the kids are in bed! And after yesterday's post, I felt bad about not giving away anything here on my bloggy - not even, as my friend Jen pointed out, cookies. I'm such a terrible blogger! So I thought I'd share our Best-Cookies-You've-Ever-Had-In-Your-LIFE recipe. Because that's how much I love you. This is another recipe adapted from the recipe book Veganomicon, it's pretty easy and uber-yummy. As you can tell from the picture, these cookies never last long at our house...I can barely have them out long enough to take a picture! 2. In a large bowl, sift together flour, cocoa, baking soda and salt. 3. In a separate large bowl, mix together oil and sugar. Add flaxseeds, milk, and vanilla. Mix well. 4. Fold in dry ingredients in batches. The batter will start to get too stiff to mix with a fork, so you could use your hands to mix, or if you don't want to get dirty you can just ask your manly-man husband to do it. 5. Add chocolate chips. Keep mixing until everything is well incorporated. 6. Either line two baking sheets with baking parchment or if you have a stone cookie sheet (I have two...I can't bake without them!) you can use them instead. 7. Roll the dough into 1-inch balls (this is where Inara commented on how Daddy's balls were better than mine. Hee-larry-us. ), and flatten into disks that are about 1 1/2 inches in diameter. Place about an inch apart on cookie sheets. 8. Bake for 10 minutes (mine really do take 10 minutes...no more, no less!). Remove from oven and let cool for 5 minutes, then transfer to a wire rack to cool completely. 9. 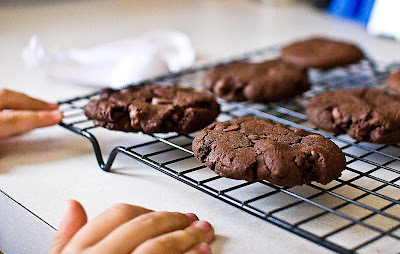 Try to take a picture of your lovely cookies while they are cooling, only to have your child try to swipe them from under your lens. Good times!